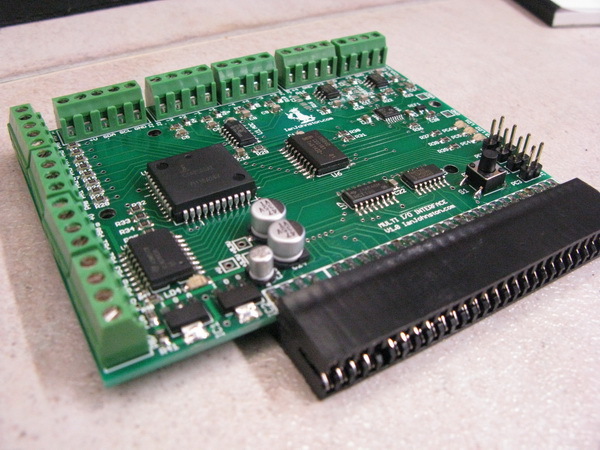 A Multi I/O Expansion Board for the ZX Spectrum giving Analogue Input/Output, Digital Input/Output and I2C expansion capability. A Multi I/O board for the Sinclair ZX Spectrum. Featured as a design project right here at IanJohnston.com this interface gives the Sinclair ZX Spectrum multiple I/O connectivity by way of an interface which plugs into the rear expansion port of the ZX Spectrum. I never intended to sell this product as it was just a project for myself, however, there has been some interest so I have built up a few to sell, albeit at just over cost price. The project page here describes the design in detail including the hardware & software. Important: Please check it out, it gives far more detail on the interface that I don't want to simply repeat here. A knowlege of how to use the ZX Spectrum, ZX Spectranet card & Boriel ZX Basic Compiler is assumed. USB flash drive containing a copy of the open source development software I collected during the project (Spectranet zmakebas, z88dk C Compiler, Boriel ZX Basic Compiler, ZX Spectrum TNFSD), and also the demo BASIC program I wrote which demo's how to program the interface. Printed diagram showing the I/O connections. ZX Alioth Spectranet Interface. Required if you want to replicate my own DEV system. You can get them from various sources, i.e. here. 16bit Analogue Output = Range 0 to 5vdc (0 - 65535, actual minimum output voltage typically 0.05Vdc). 16bit Analogue Input = Range 0 to 10Vdc (0 - 65535). Digital outputs = ULN2803 darlington logic buffer. Datasheet here. I2C = Bi-directional I2C communication to further external Slave. NOTE: The interface is tested with a 48K ZX Spectrum Issue 2 (Important: It is untested with other versions, I do know it doesn't work with the 128K Toastrack, I never got around to troubleshooting). Here is the compete assembled board ready to plug into the ZX Spectrum / ZX Spectranet card. This photo show the major components on the board and the designation of the screw terminals for the I/O. Under development in my own workshop. The interface is plugged into the Alioth ZX Spectranet card (not included in the sale).